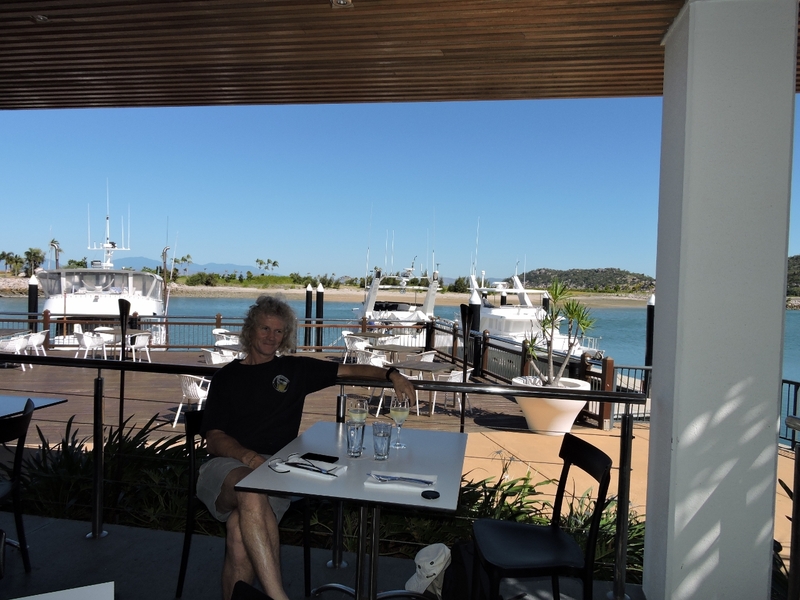 We weren’t intending to stop at either Magnetic Island or Townsville, but Horseshoe Bay on the north side of Magnetic Island made a convenient stopover after Upstart Bay. 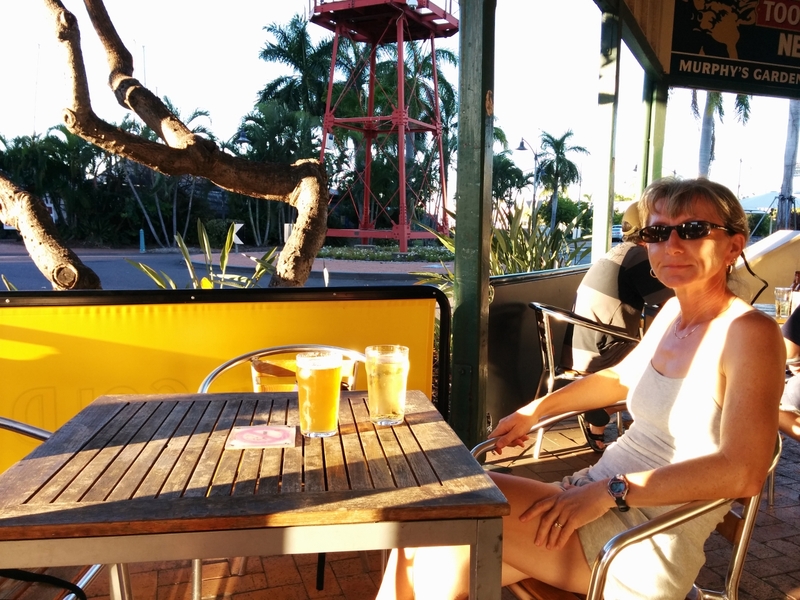 One night turned into two and was almost to three when Townsville resident Mick Malone called and encouraged us to visit there. Mick is a longtime friend of Nordhavn 57 Speedbird owner David Fincham, who introduced us. 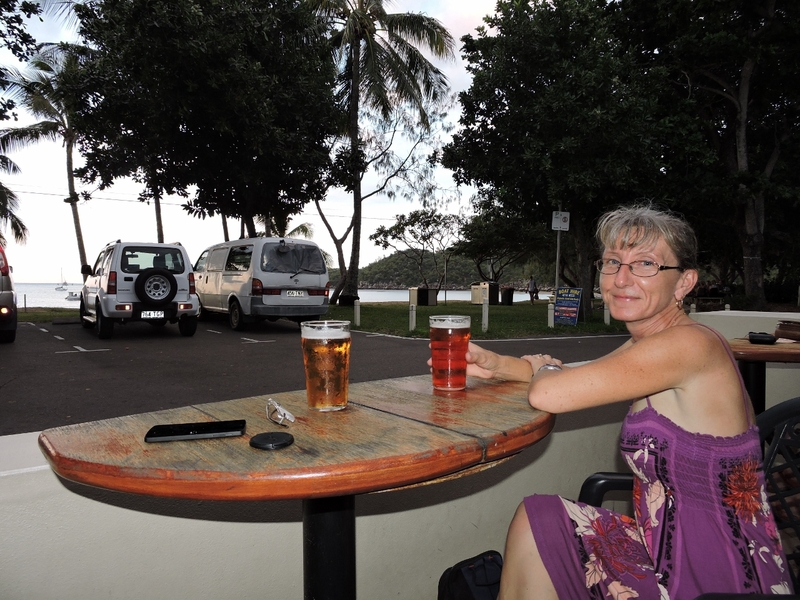 We initially expected to spend two nights in Townsville, and dragged ourselves away after almost a week. 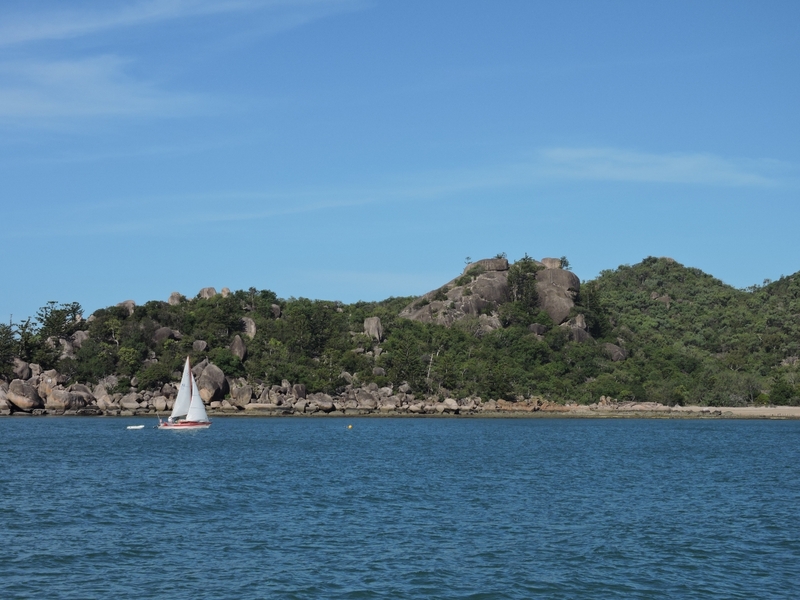 But we didn’t make it far–we spent two more nights on Magnetic Island before our run north. Maybe that’s why they call it Magnetic. 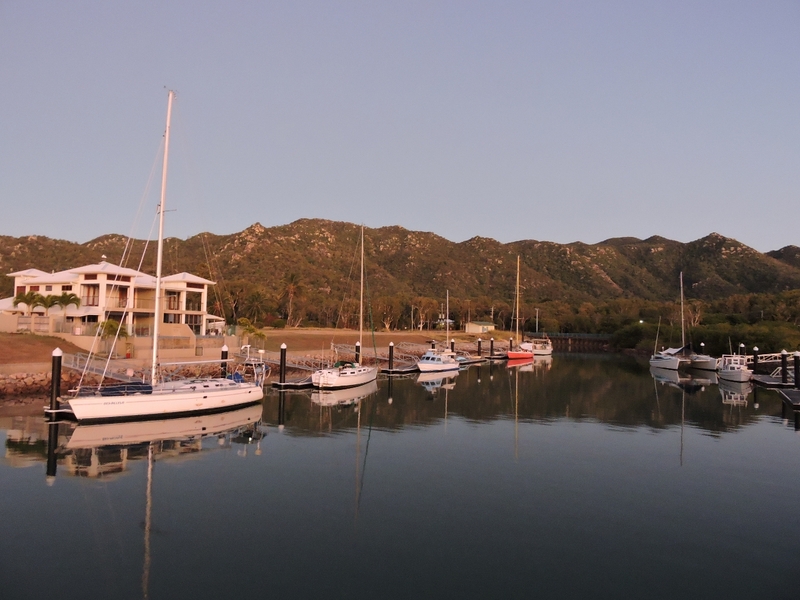 Horseshoe Bay, at the north end of Magnetic Island, is quite scenic and we enjoyed our stay there. 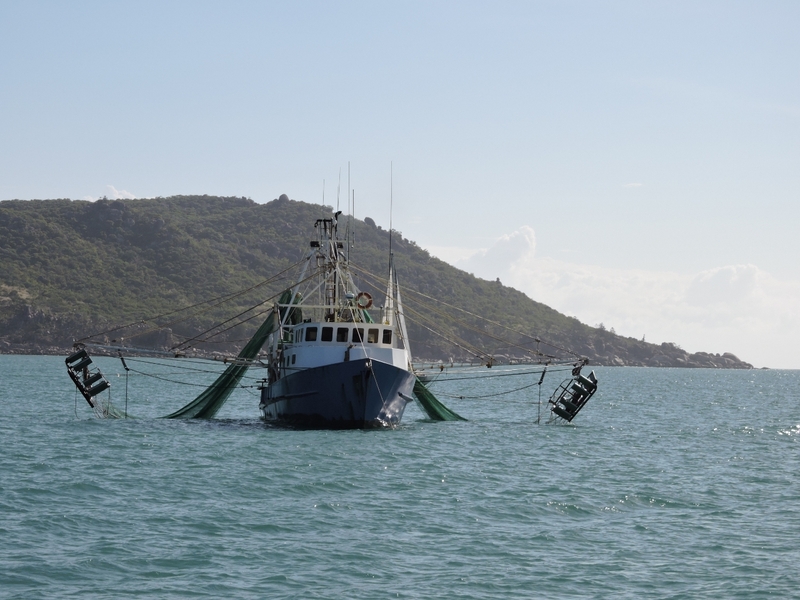 Several fishing vessels such as this anchored in the bay during the day, then left to go to work at night. They kept their gear in the water, likely to reduce boat motion. 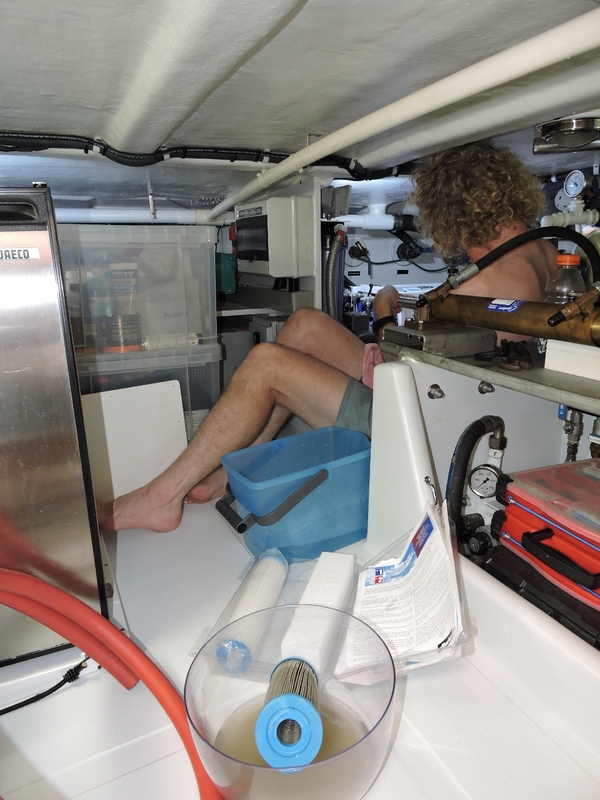 A fair bit of swell does reach the anchorage, so we eventually put out the flopper-stopper (passive at-rest roll stabilizer) too. The watermaker is just coming up on 1,000 hours after 5 1/2 years of fairly heavy use. The water quality still is well within usable bounds, but has slowly been degrading over time. So it’s time to give the membranes a thorough clean and see if we can get another year or two out of them. The cleaning process involves circulating an alkaline solution for 30 minutes, flushing for 10 minutes, circulating an acid solution for 30 minutes, flushing for 10 minutes, and then bringing the system back online. This actually is a fairly involved process where we removed the outlet hose at the through-hull and plumbed it into the watermaker input, forming a loop. After adjusting the high pressure pump to 0, we removed the prefilter, replaced it with an alkaline treatment, and circulated the system with the high and low pressure pumps for 30 minutes. Then we restored the plumbing, flushed the system for 10 minutes, replumbed the loop and circulated again using an acid treatment for 30 minutes. After restoring the plumbing for a final time, we flushed for another 10 minutes and finally adjusted the high pressure back to its original setting. This process improved the water quality by 100 ppm and probably will extend the life of the membranes for another year. But there’s no hiding from the fact that we’re getting close to replacement time. Horseshoe Bay has a small main street with several restaurants. We had an enjoyable meal street-side at the Marlin Bar, overlooking the beach and the bay. The sky was clear when we left Dirona, but as we launched the micro-tender to return, a torrential downpour started. We waited it out for about a half-hour, but eventually gave up and headed back anyway. Visibility was terrible, but Dirona‘s deck lights make it easy to find in even a large anchorage field. We were drenched by the time we got back to the boat, but enjoyed the adventure. 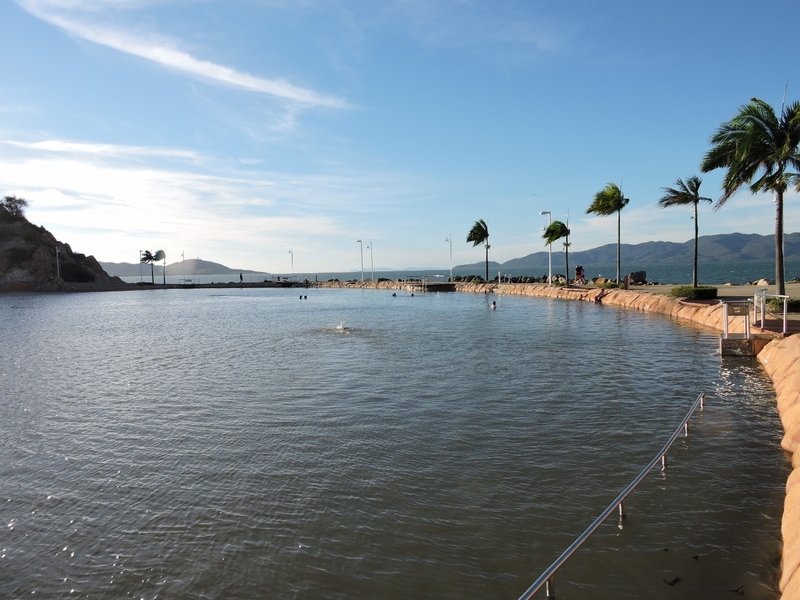 Narrow Platypus Channel leads to the Port of Townsville. Small craft are allowed to pass large ships under way in the channel, but not in the swing basin or entry channel. A light atop the control tower flashes red if these areas are closed to small craft while a ship is maneuvering there. 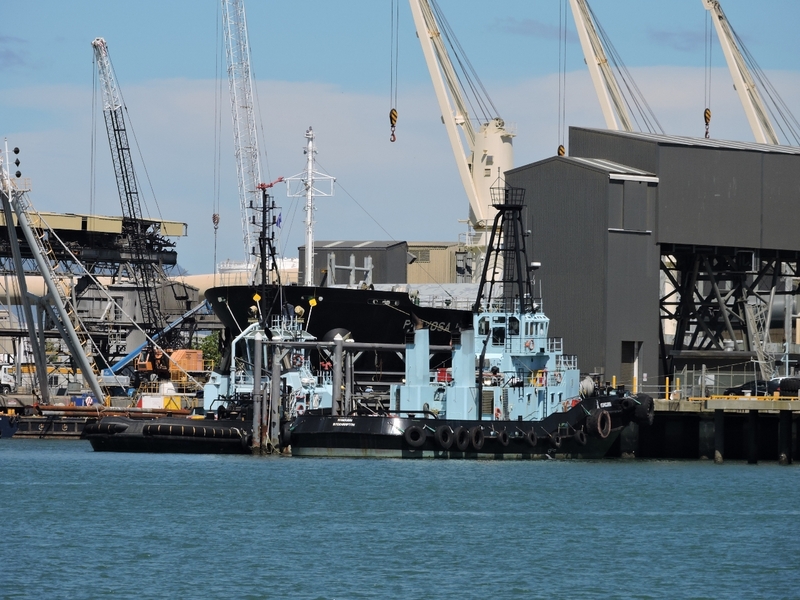 The Smit Lamnalco tugs Kungurri and Herbert moored together in the port. 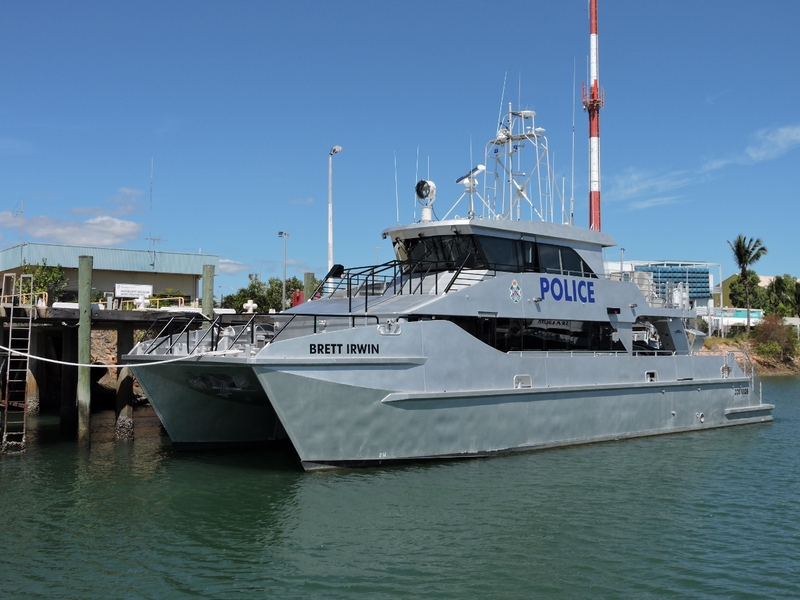 The local police boat Brett Irwin. 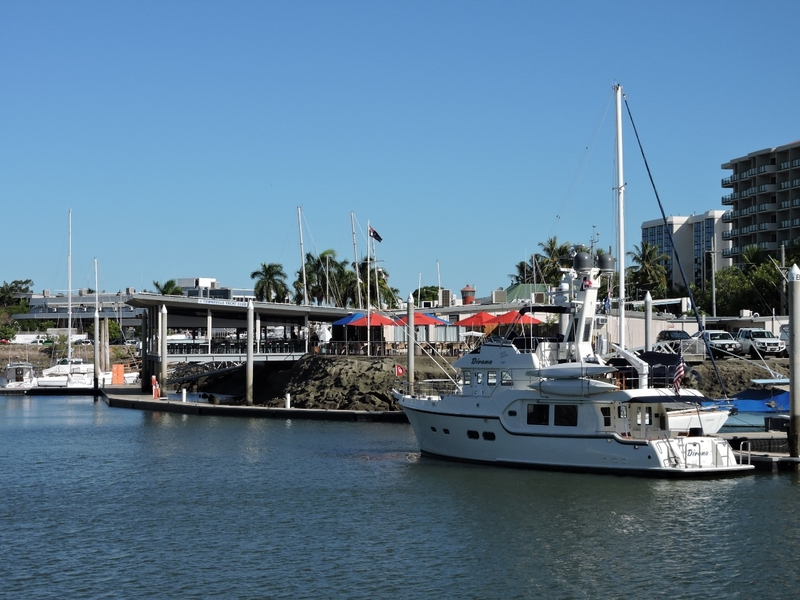 Proceeding past the port along Ross Creek towards the Townsville Yacht Club. 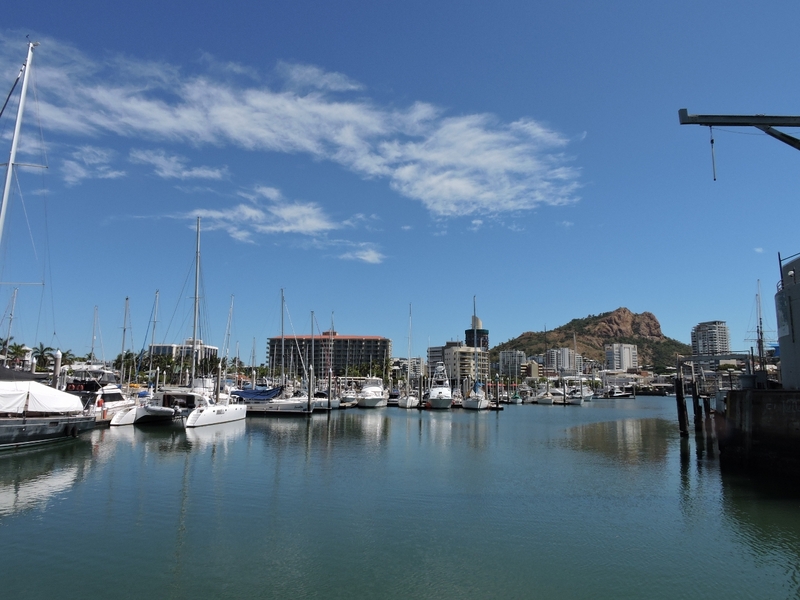 Downtown Townsville is just beyond on the right, below the striking Castle Hill. 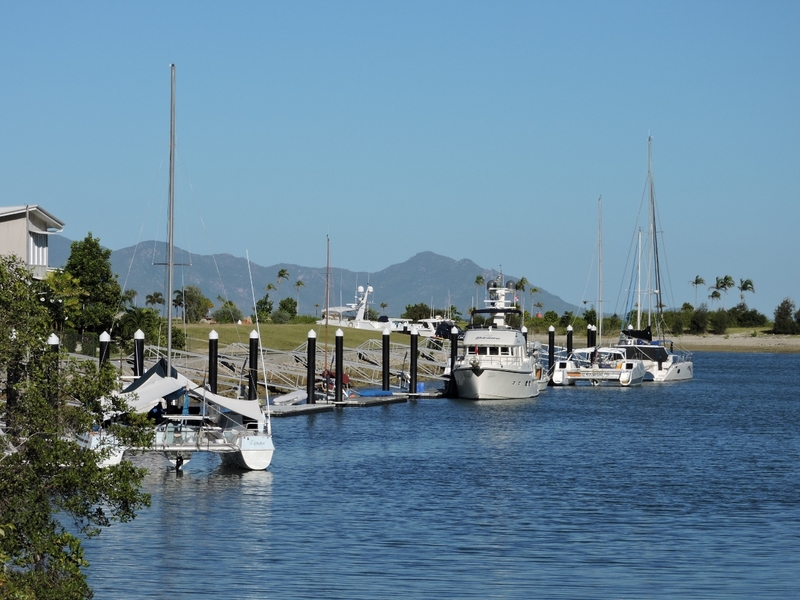 Looking across Ross Creek to our berth at the Townsville Yacht Club. The restaurant and clubhouse is on the left. 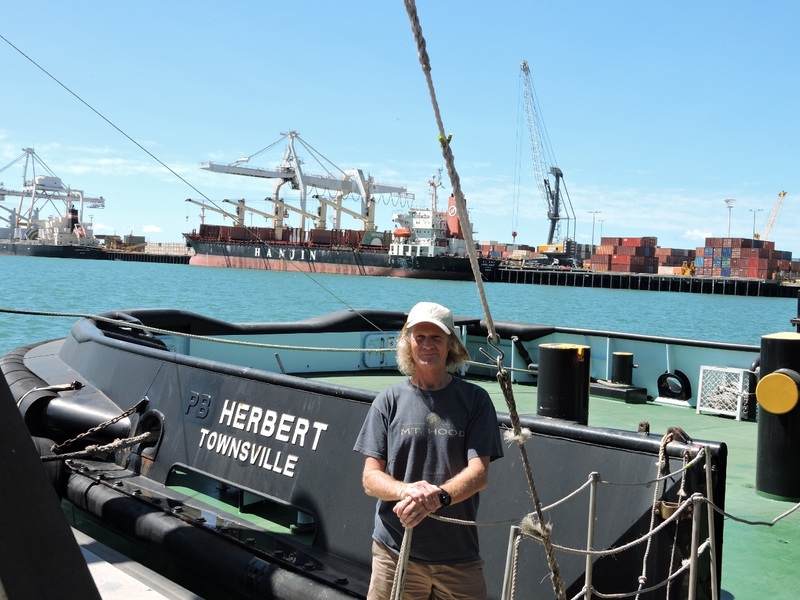 We weren’t actually planning to stop in Townsville, but local Mick Malone encouraged us to visit and even arranged for this excellent berth. Mick is a longtime friend of Nordhavn 57 Speedbird owner David Fincham, who introduced us. From the marina we walked through town and north along the Strand, a 1 1/2-mile beach-front promenade along the Townsville waterfront. 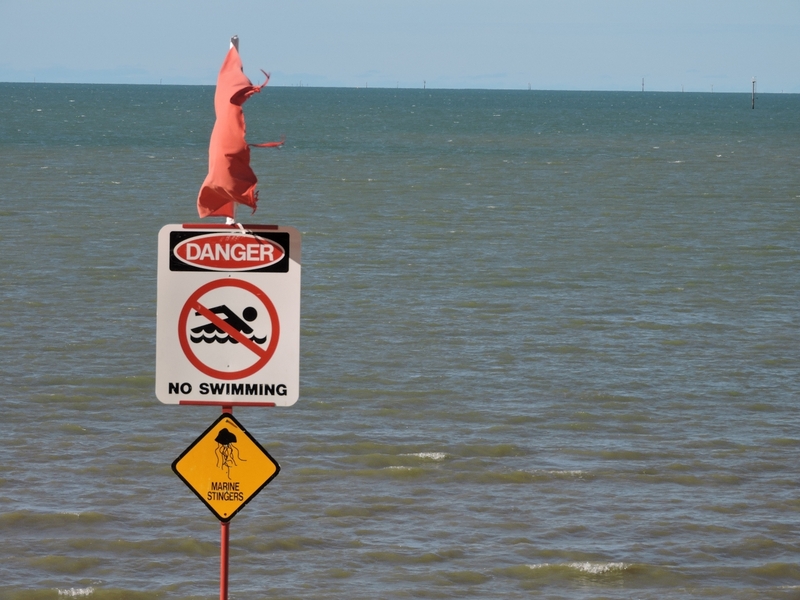 Most of the beaches were closed–November through May is high season for marine stingers (jellyfish) on the Queensland coast. The box jellyfish is particularly hazardous–it is mostly found in shallow waters near the mainland shore and can deliver a fatal sting. Some beaches farther along the Strand had stinger nets, large net-enclosed areas where people can enjoy the water in relative safety. 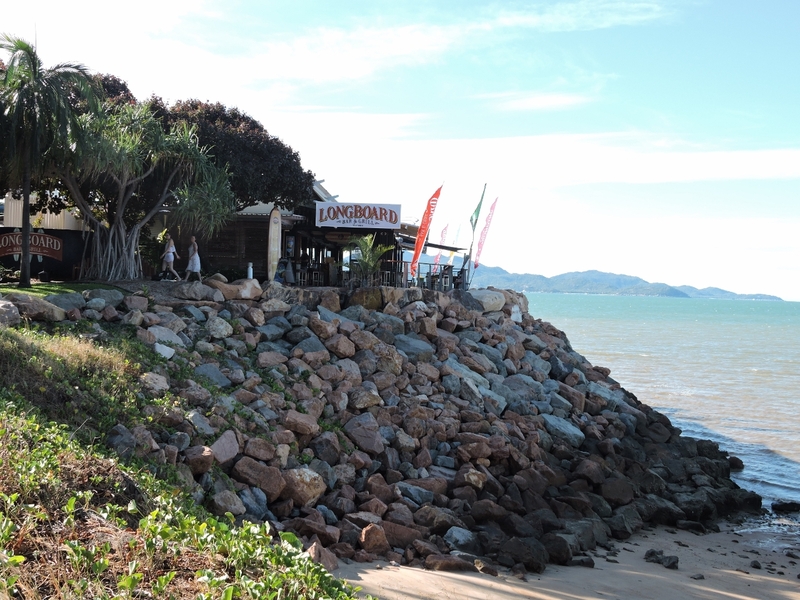 We stopped for a great meal at the Longboard Bar and Grill, perched on a point with views west to Magnetic Island and south Platypus Channel and the Port of Townsville. The huge and beautiful rock pool at the northern end of the Strand. The headland north of the Strand has sweeping views of the area and was a military precinct from 1887 to 2006. 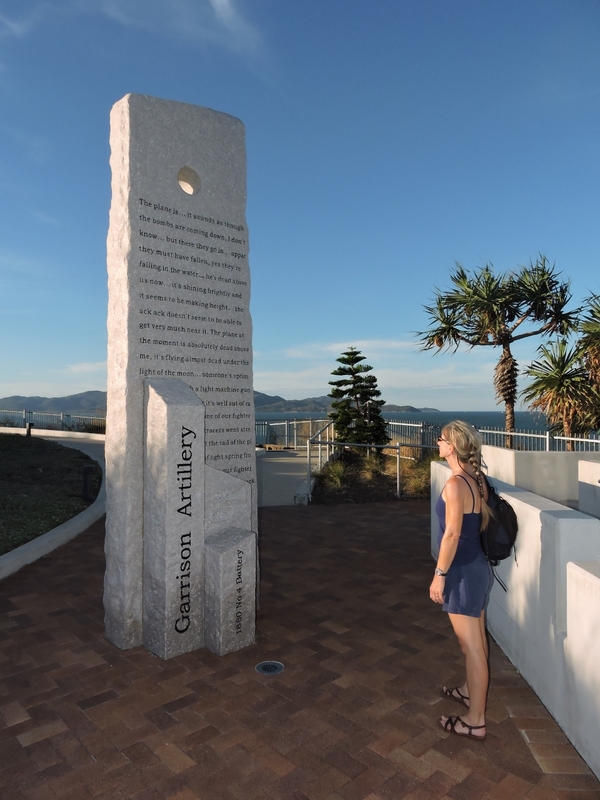 The city of Townsville has since restored some of the fort and redeveloped the area as a beautiful park, with extensive artwork and interpretive displays detailing the area’s history. 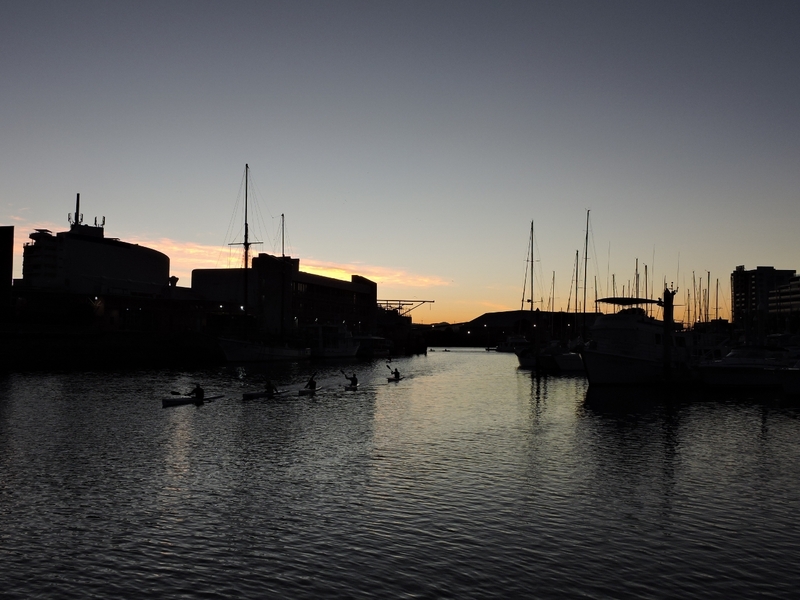 Rowers frequent Ross Creak in the mornings and evenings. 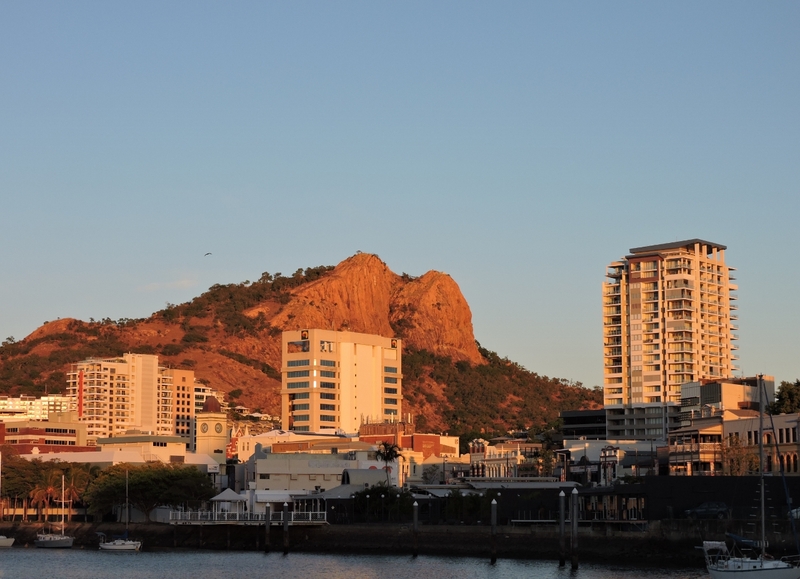 The morning sun lighting up Castle Hill to our north, with part of downtown Townsville visible in front along the water. We’re really enjoying being here in Townsville. 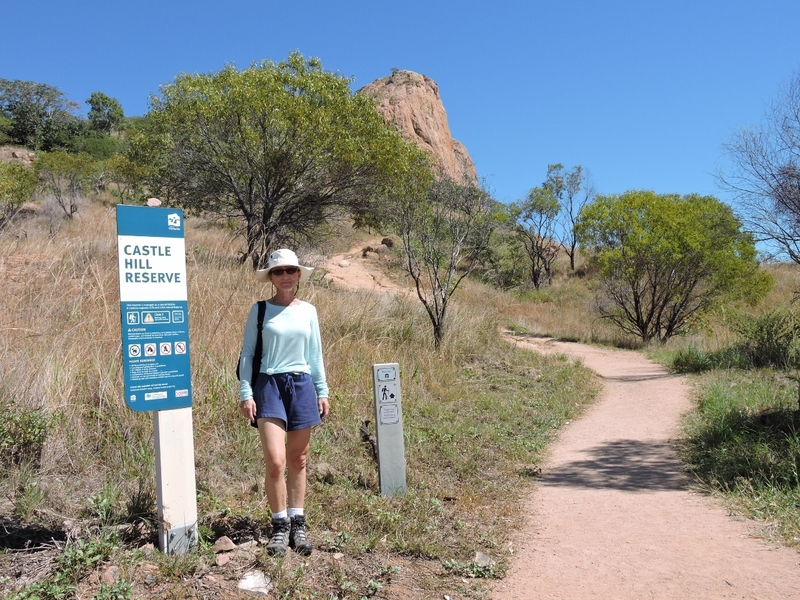 From the moment Jennifer sighted Castle Hill yesterday, she’s wanted to get to the top. So this morning we took the Goat Track up. 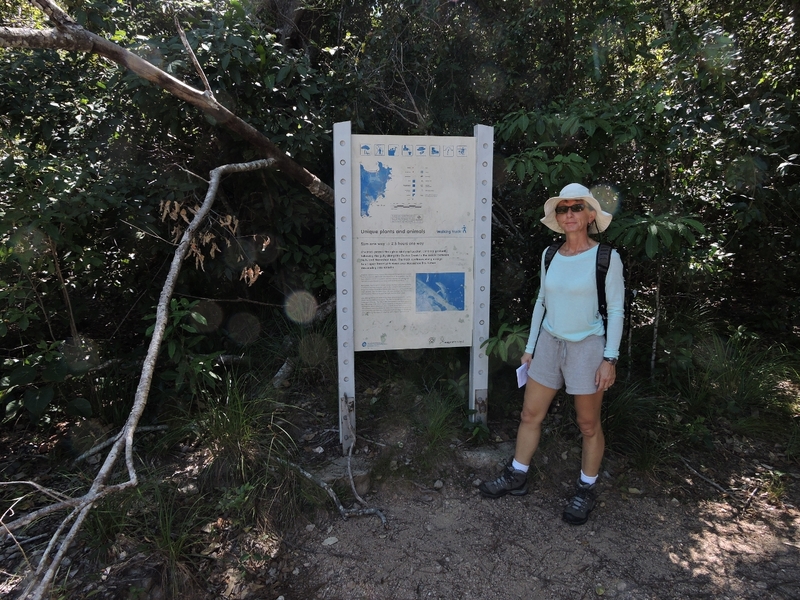 We took the Cudtheringa Track back down from Castle Hill and stopped again at Longboard for lunch, then continue back through town and out to the port. 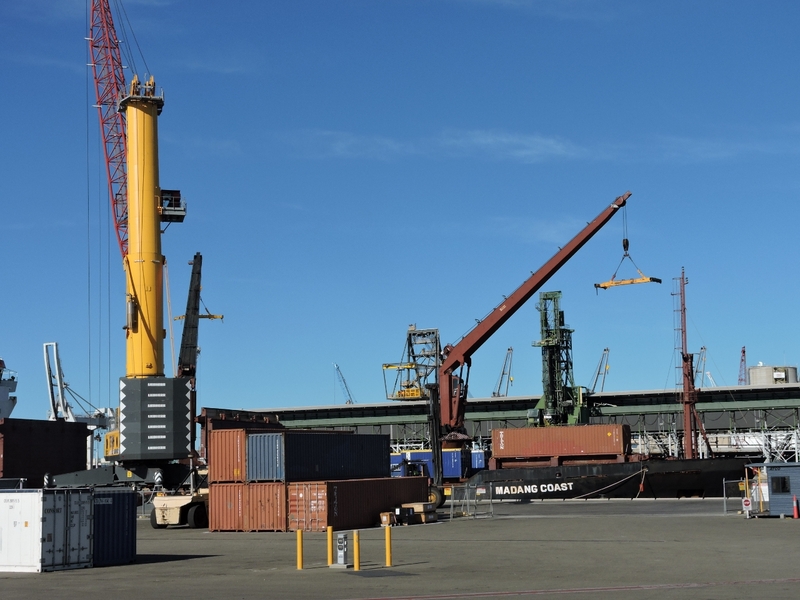 At the new Quayside Terminal, we found a good vantage to watch a ship taking on containers via crane. 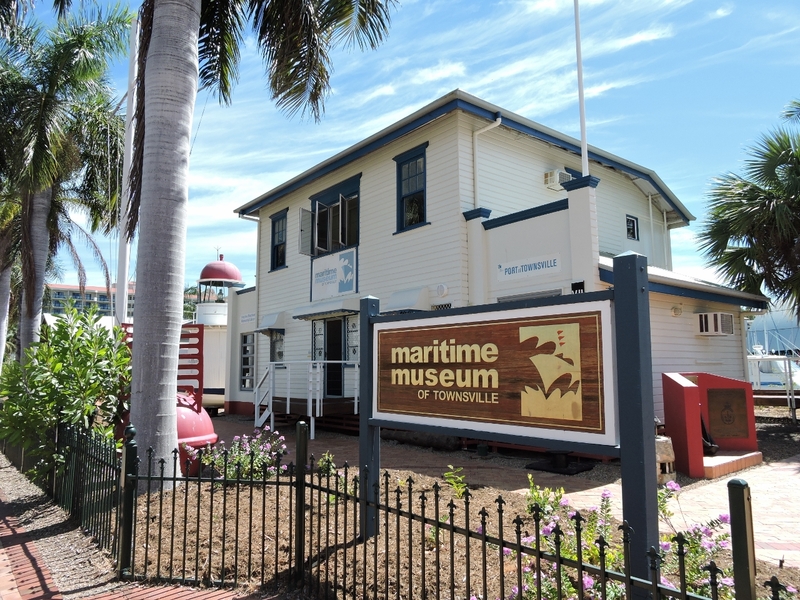 We visited the Maritime Museum of Townsville today. Featured displays include northern Queensland’s involvement in World War II, and the wreck of the SS Yongala. The Yongala sank about 48 miles south of Townsville during a 1911 cyclone and now is one of the top wreck dives in the world. We plan to dive it in a couple of days so were particularly interested in learning more about the vessel’s history. We’ve almost completed the installation of an external alarm and warning light. A few days ago we ran a wire from the pilot house to the base of the stack. 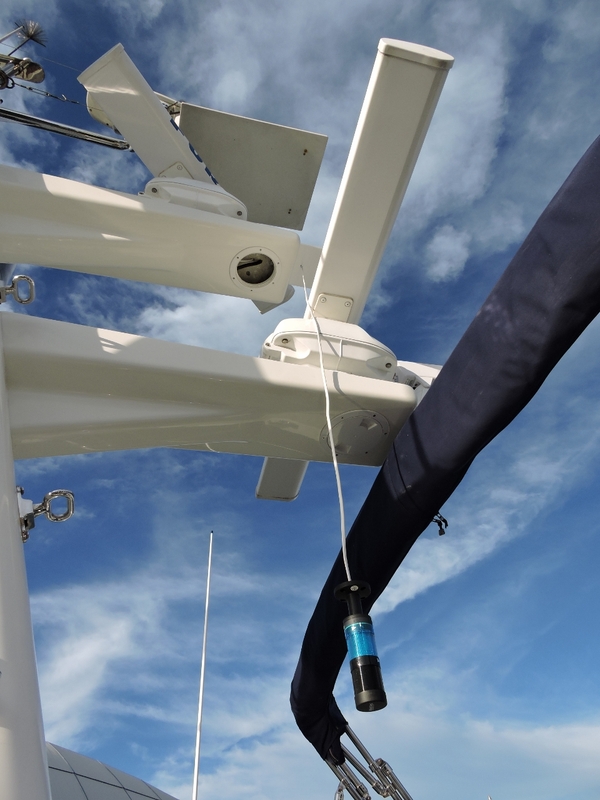 Today we ran the wire up the stack, along the upper support arm, and down through the marineboard shield that prevents the steaming light from illuminating the foredeck. In this photo, the light/alarm is wired in and we just need to mount it permanently under the marineboard shield. 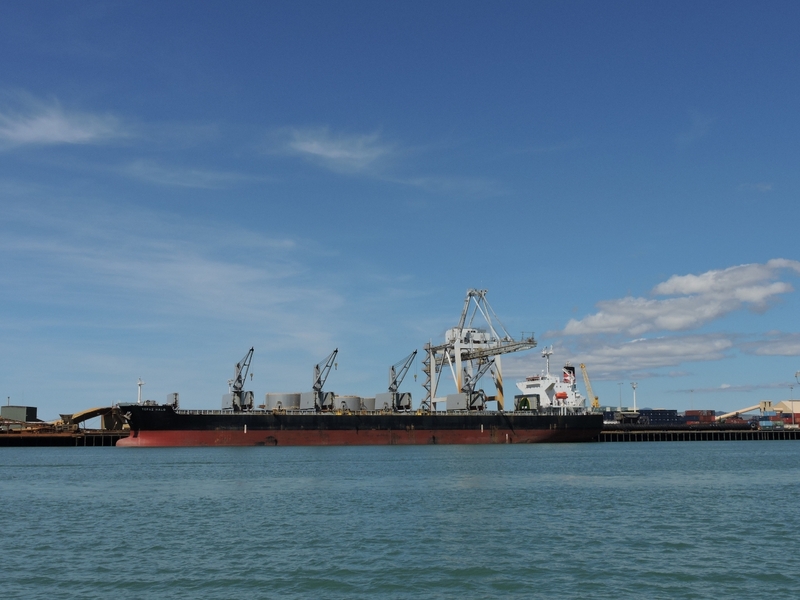 Mick Malone invited us to tour the tug SL Herbert today, and to ride along while he escorted the cement bulker Alcem Lugait into the Port of Townsville. Read more. The SS Yongala is a world-renowned wreck dive about 48 miles south of Townsville. 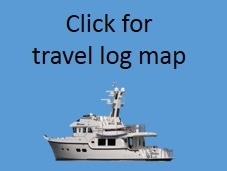 Boats must have a permit to visit the site, so we booked a day trip there with Adrenalin Dive. The diving was fantastic–the hundred-year-old wreck is encrusted with corals and surrounded by huge schools of small and large fish. It was a memorable trip, so we’ll blog pictures and video this week. 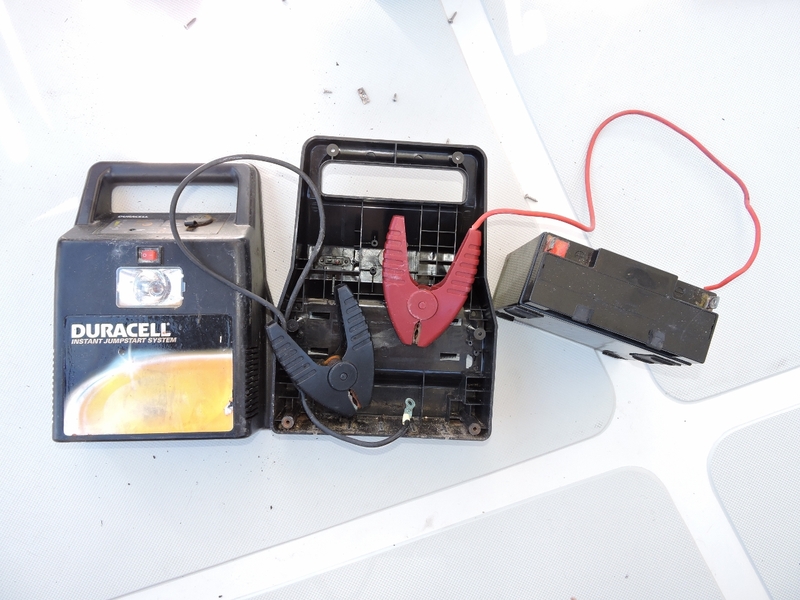 Once a year we charge and test all of our backup batteries. The dinghy emergency start system has failed, showing only seven cold-cranking amps. 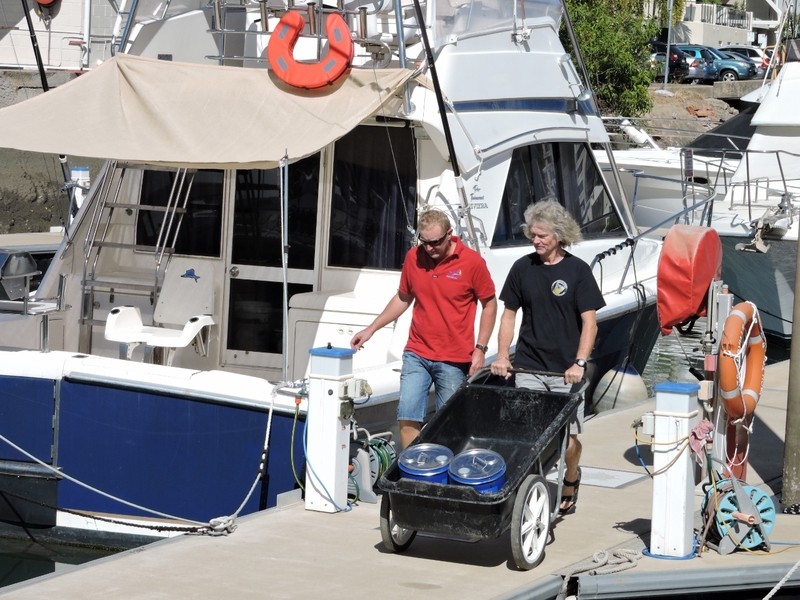 Rather than replace the battery in the emergency start system, we instead grafted its switch and cables onto a spare dinghy battery that we carry on-board Dirona. 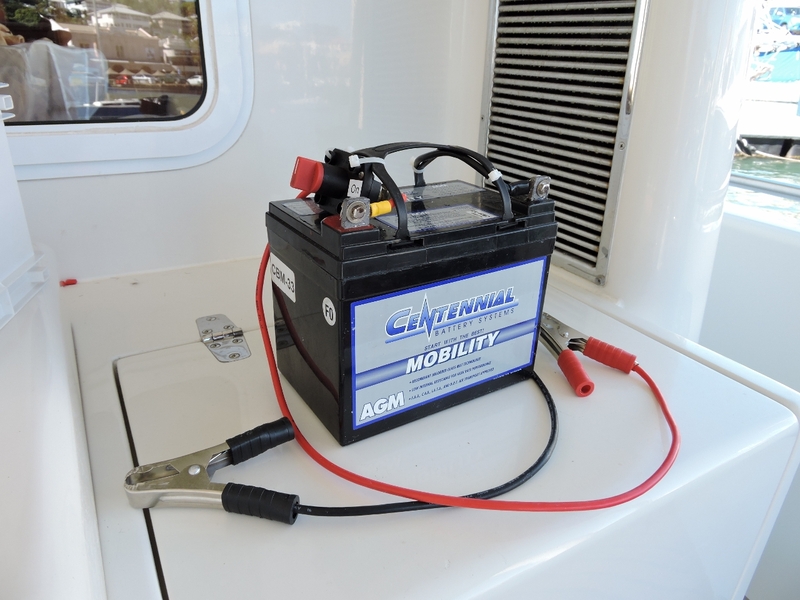 This will give double the emergency backup battery capacity and is one less type of battery we have to carry. We’ll keep this one in the dingy and get a third to carry as a spare. 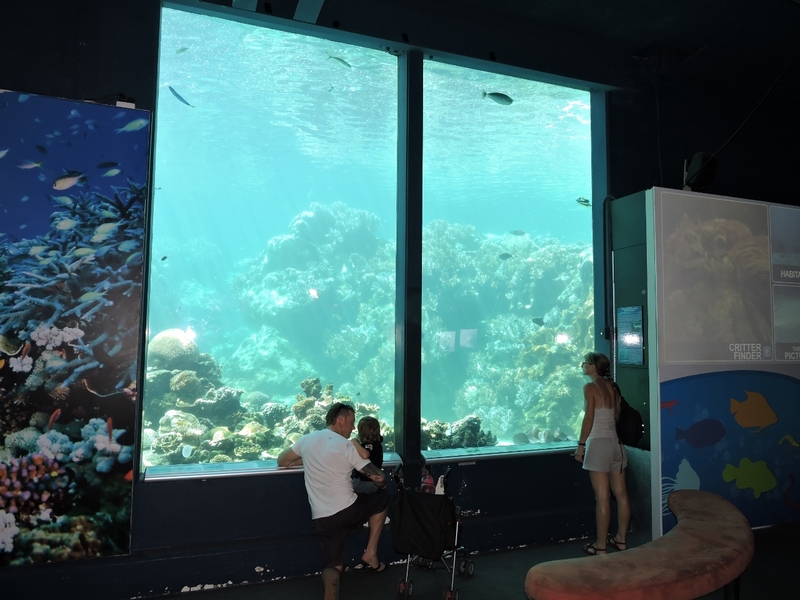 The Great Barrier Reef Aquarium features a 2.5 million liter saltwater aquarium teeming with life and a walk-through tunnel. We were impressed at the health of the coral and the wide range of fish, including several kinds of sharks. The novel and various film adaptations of Mutiny on the Bounty made famous the story of Captain Bligh, who was set adrift by mutineers on his ship the HMS Bounty. Captain Bligh survived and returned to England to report the crime, and the British Admiralty dispatched the HMS Pandora to hunt down the mutineers. En route back to England with some of the captured mutineers, the Pandora struck a reef off northern Queensland and sank. 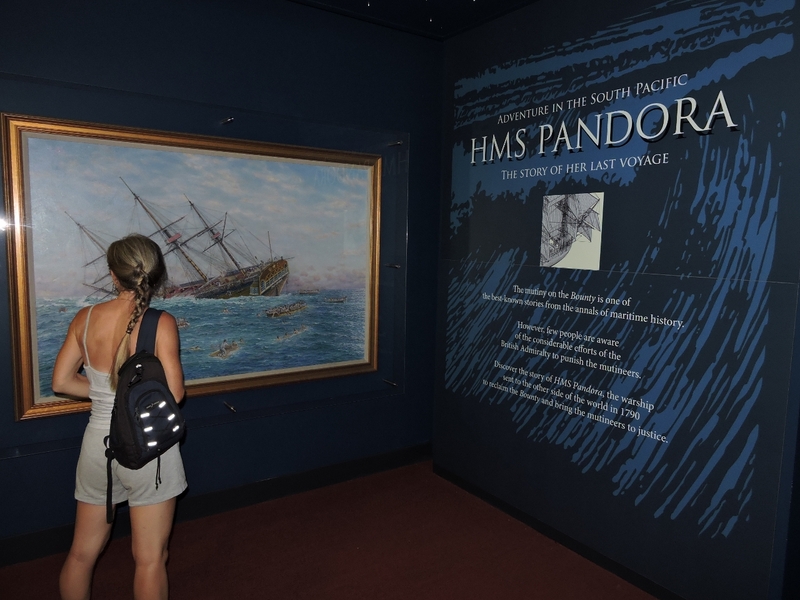 The Museum of Tropical Queensland has an excellent and extensive display on the HMS Pandora including numerous articles salvaged from the wreck. Cold drinks street-side at the Shamrock, one of Townsville’s several Irish pubs. Mick Malone dropped off two 20-liter pails of Caltex Delo 400LE. We now are back to having a full oil supply, where we can change the main engine oil three times and the generator twice. 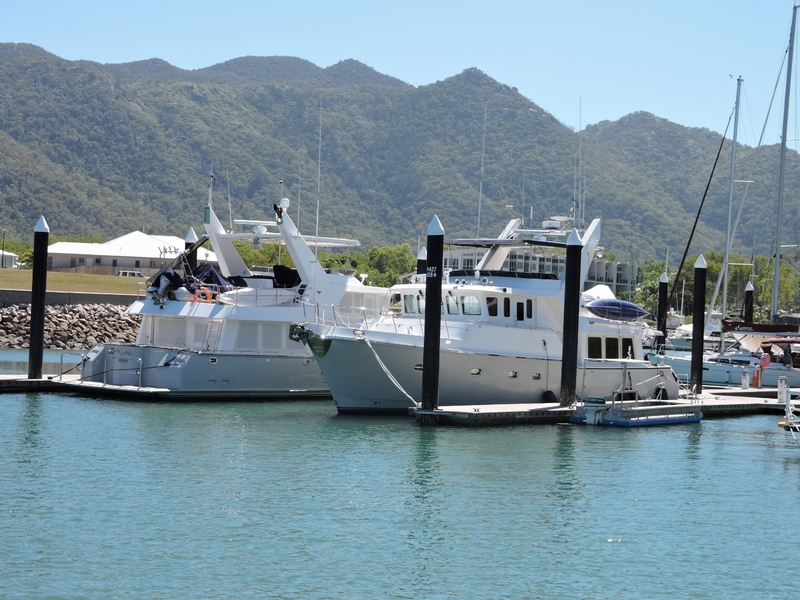 We took on 3233 liters of diesel fuel at the Trawler Dock in Townsville’s new marine precinct. 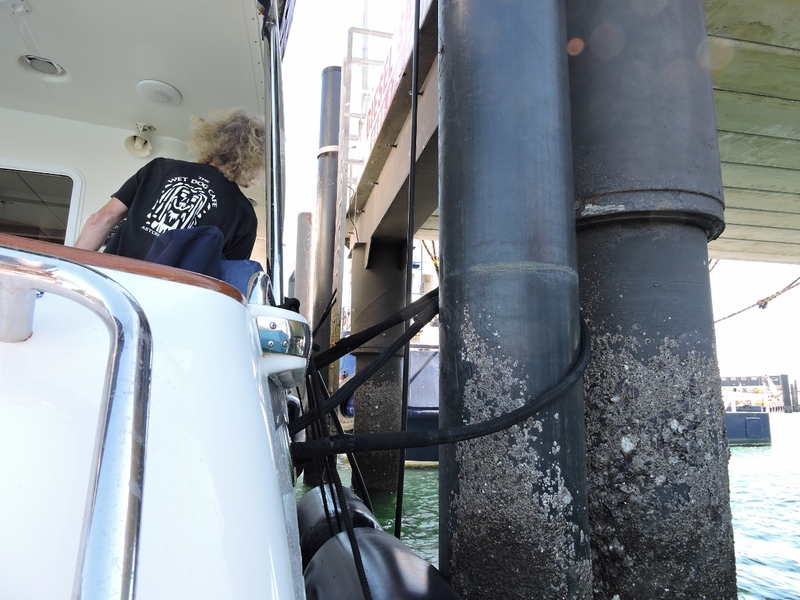 Typical of fueling facilities for larger commercial vessels, you’re up against large piles and the dock is a long way up. The attendant was so far above us that Jennifer paid by handing a credit card up from the boat deck. 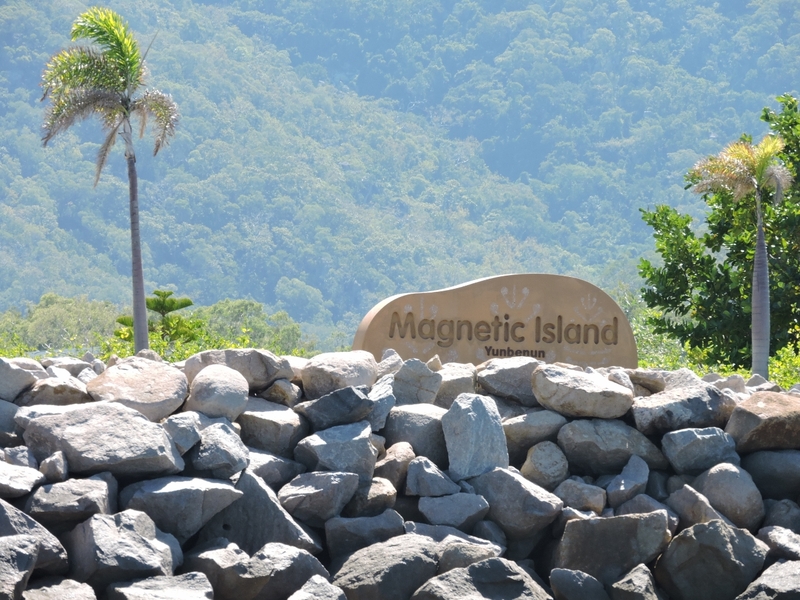 Back to Magnetic Island, this time to Nelly Bay where the Townsville ferry lands. We’re the third Nordhavn in Nelly Bay. Already here are Nordhavn 57s Time 2 and Myrtle. We keep in touch with Time 2 owners Mike Drinkrow & Lynn v/d Hoven, but surprisingly haven’t seen them since Namena marine reserve in Fiji. Unfortunately we won’t see them here, as they are on a trip home to South Africa. We had an exceptional lunch at the Boardwalk Cafe, overlooking the ferry dock, Time 2 and Myrtle. 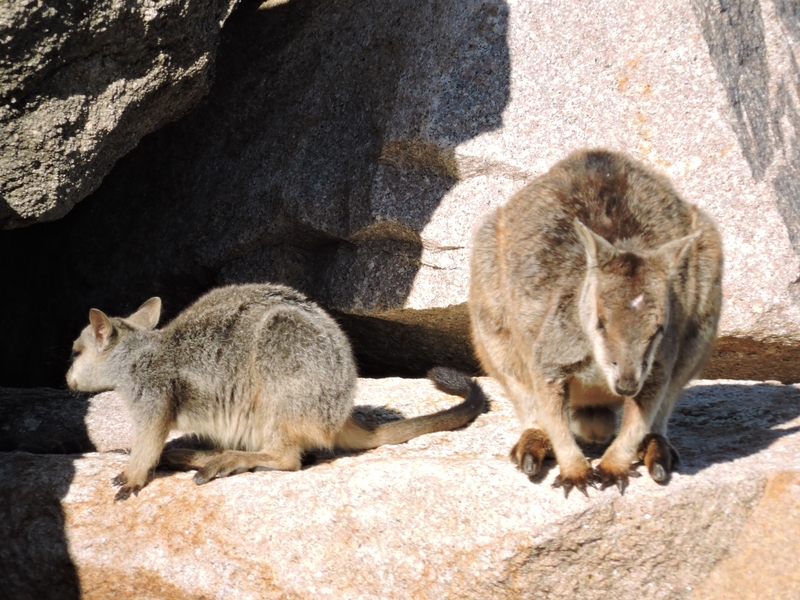 Two of several Rock Wallaby along the harbour breakwater. Mick Malone has continued to spoil us by offering us use of the berth they share in Nelly Bay. 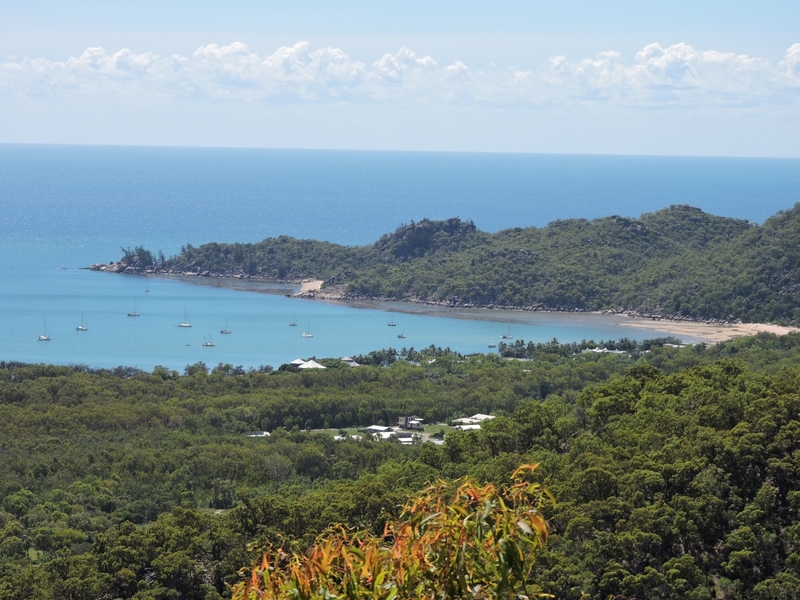 It’s a lovely, peaceful spot with great views north to the hills on Magnetic Island and great walking tracks nearby. Dawn looking southeast from our berth. 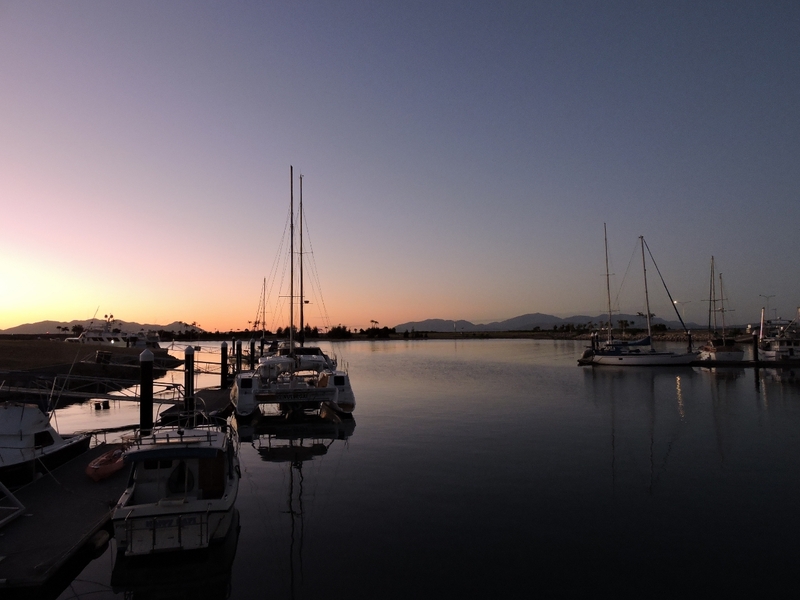 The morning sun lighting the boats across the waterway from us. 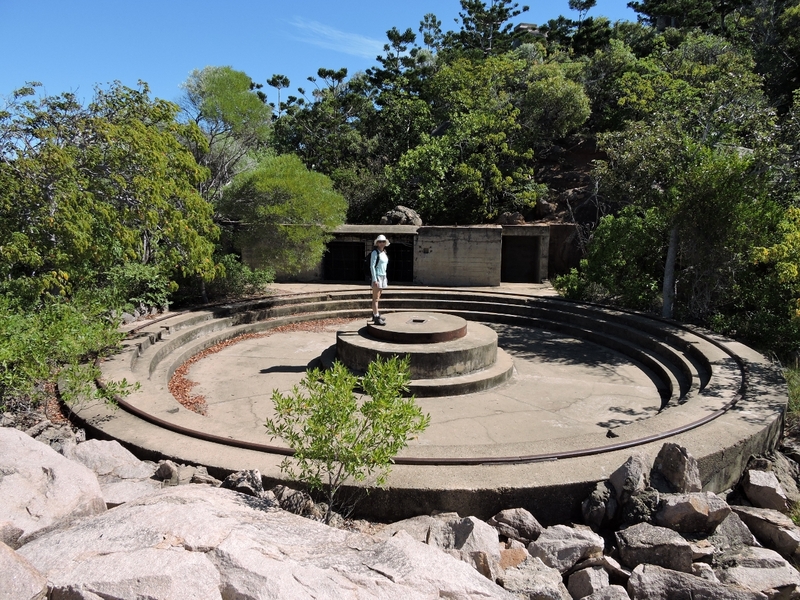 We set off this morning on a 4-mile walk to The Forts, a World War II military base in the hills at the northeast corner of Magnetic Island. This is the start of the track at the end of Mandalay Avenue. The track is easy walking, but did climb steadily upward. The reward for that exertion is a clear view to Horseshoe Bay where we’d anchored over a week ago. From this point we can continue south to Arcadia or north towards Horseshoe Bay and our destination, The Forts. 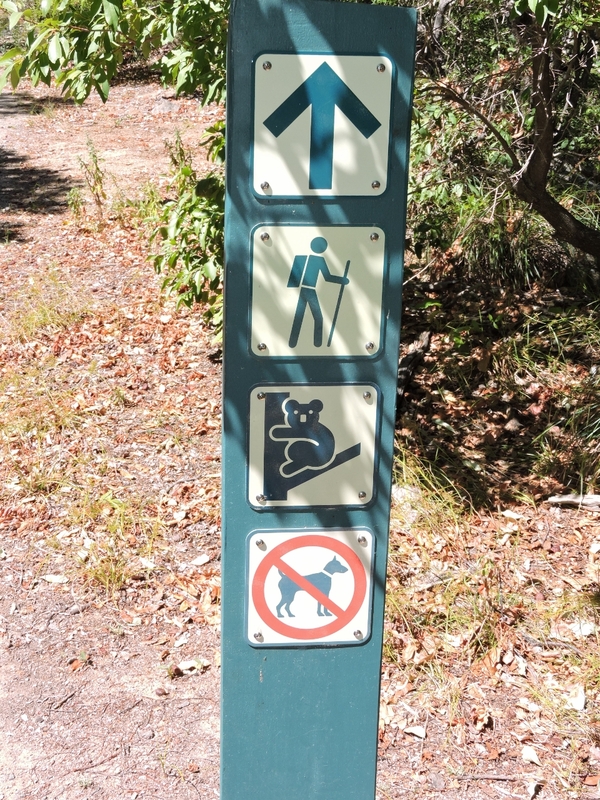 We’ve seen all kinds of interesting wildlife signs in Australia. 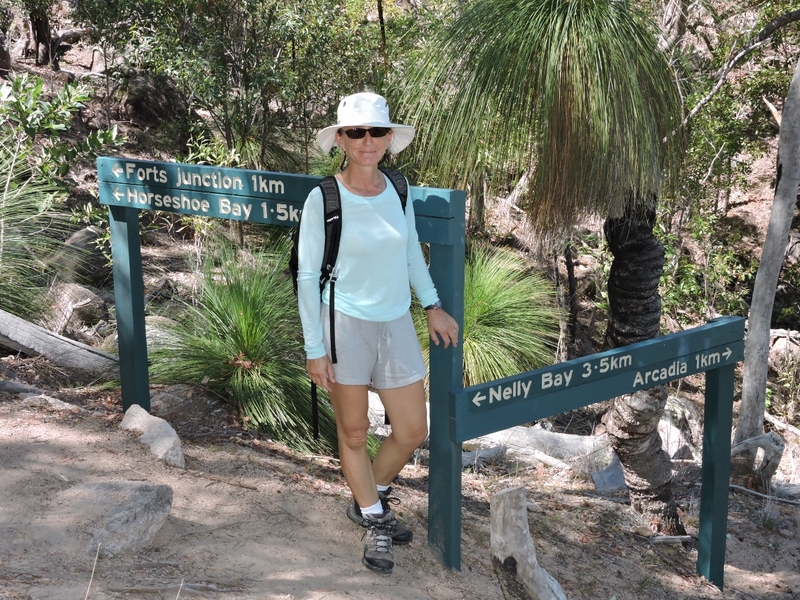 This one at the start of The Forts track indicates dogs are not allowed, hikers are ok, and that wild koalas live in the area. The view to Arthur Bay from the road to The Forts. One of two 155mm gun emplacements in the complex. We stopped for lunch on the bluffs below one of the gun emplacements. 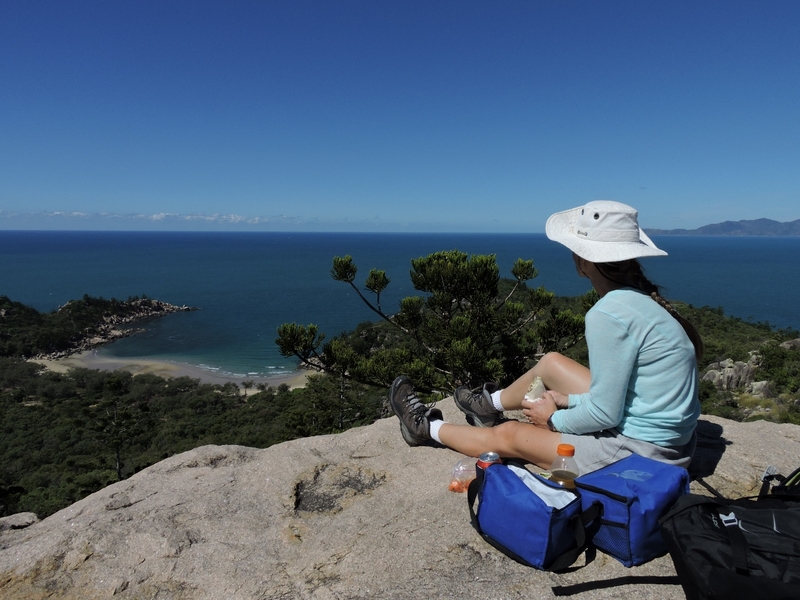 The tip of Cape Cleveland on the mainland south of Townsville is just visible at the right of the photo. The Command Post has as amazing 360-degree view. 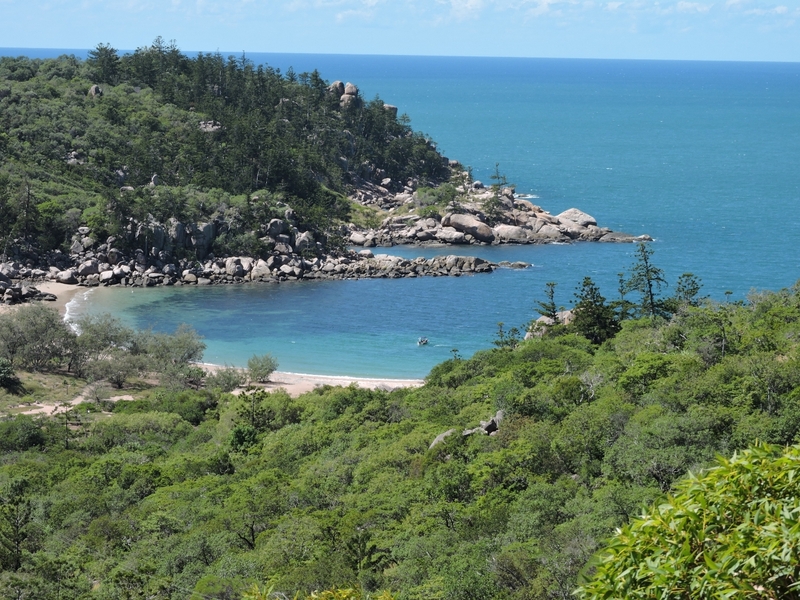 Horseshoe Bay is at the left of this panorama, Florence Bay is right of center, and Cape Cleveland on the mainland is visible in the distance. From The Forts we walked into Arcadia and followed the beautiful new Gabul Way track along the coast and back into Nelly Bay. 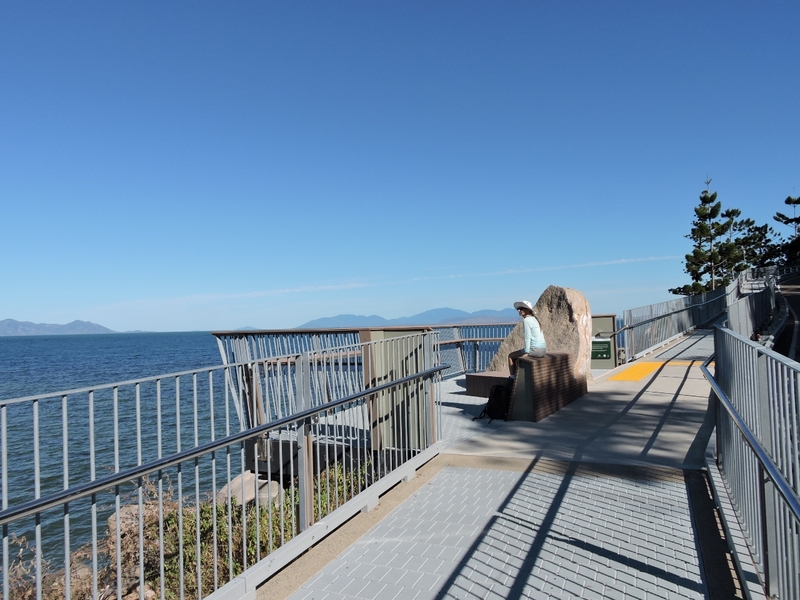 This is the view looking east towards the mainland.